Basketball has its March Madness. PEEPS joust in the microwave. But make way for Cover Wars beginning today, March 22, hosted by www.ultimatefantasybooks.com. The first round runs until March 29. The ten book covers that receive the most votes move to Round Two from March 31 to April 7. The two finalists go on to duke it out with the winner being announced on April 14. The Redoubt is also in a cover contest for the online Brains to Books Cyber Convention which runs from April 8-10 on Facebook and Goodreads. I hope you’ll visit my “booth” there but meanwhile you can vote for The Redoubt in the Cover Wars. There are several matches; The Redoubt is in Match #4. 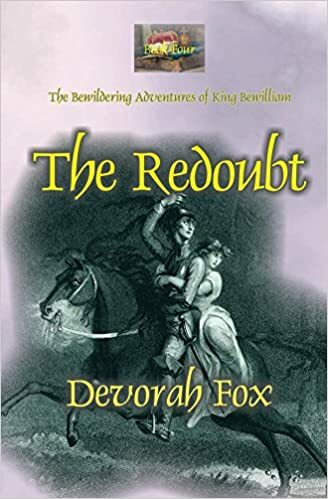 I’m just so pleased that The Redoubt is in the ring with all these wonderful book covers but winning would be nice too. So vote for The Redoubt! King Bewilliam thanks you for your support and so do I. This entry was posted in arts&crafts and tagged arts&crafts, events, fantasy, read. Bookmark the permalink.